Photivo is a free and open source (GPL3) photo processor. It handles your RAW files as well as your bitmap files in a non-destructive 16 bit processing pipe with gimp workflow integration and batch mode. Download installer @ https://code.google.com/p/photivo/downloads/list and uniextract. To enable portable mode create an empty file called use-portable-profile (no file extension) in Photivo’s program folder (where photivo.exe is located). Last edited by I am Baas on Sun Mar 15, 2015 2:09 am, edited 1 time in total. Interesting program. Dig the batch features, filters, and all sorts of other stuff I don't understand but just sounds cool. I'm almost equally interested in the very clear website and open license. Additionally, it looks like the developer intentionally is making portable software, and isn't just waiting to attach an installer. - Major changes to the file manager: The tree is replaced by a folder list view, added a simple bookmarks feature and a viewer for quick access to single images. Also various other fixes and improvements. - Fixed a bug that could lead to input image files being deleted. This program has a bewildering number of color and picture tools. A certain level of knowledge about image/color terminology is assumed and there's not much in the way of included help. The interface is unique and did find it to be a bit crashy jumping back and forth between file manager and editor, but there are clearly a lot of features here that are in no other freeware editor I've seen, much less an open source editor. Very customizable and multi-language support for French, Italian, Russian, German, Dutch. Even with its flaws, it is in many ways the most advanced freeware photo editor I've yet seen, much less an open source offering. Will definitely add to the database sometime soon. Photivo 2012-06-13 revision 40744585ea5a is out. New option to remember the pipe config between sessions. When you select Latest.pts as as your startup preset in “Settings › Startup settings” Photivo saves the current pipe configuration to that preset on each program exit and loads it again on next start. When you want to store a preset permanently do not use Latest.pts! Photivo may change that file at any time without warning. Big long-standing feature requests like a flexible pipe or undo are now possible (though still a lot of work, so don’t expect any of them in the near future). Much cleaner code throughout Photivo. Flexible filter config and GUI creation. GUI creation can be fully automatic from a single list of config items, or fully customised including Qt Designer .ui files and any bells and whistles you want, or anything in between. 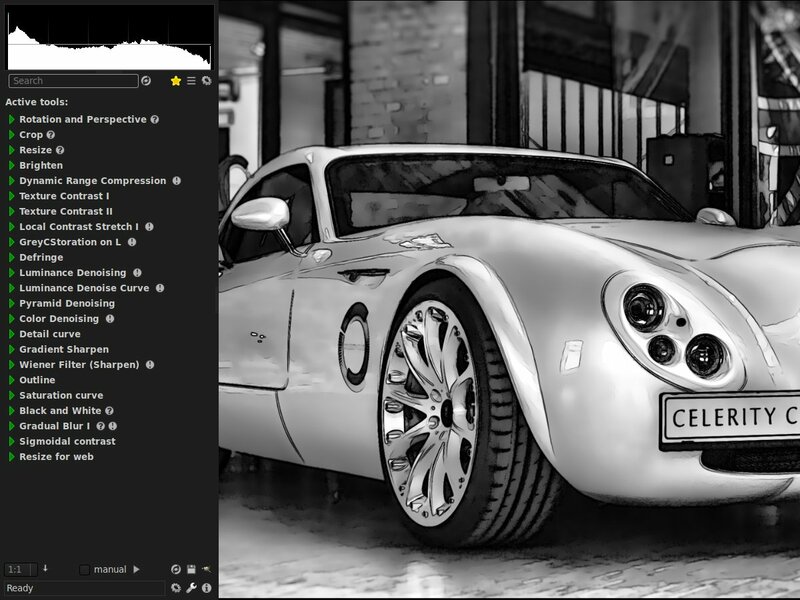 Added a second luma denoise curve on the “Lab Sharpen/Noise” tab. It’s hidden by default. Use the tab’s context menu or the “UI settings” config to make it visible. Added an option to disable auto-opening the file manager when Photivo is started without an image. Old stand-alone curve files (the ones from the “Curves” folder) are deprecated. They cannot be opened or saved via the GUI anymore but .pts presets using them still work and will continue to work in the future. When loading an image auto-load associated settings (i.e. when a .pts with the same name as the image exists in the same folder). Ctrl+Shift+C and Ctrl+Shift+V to copy/paste settings to/from clipboard. Reset settings to startup default (Ctrl+Shift+R) or last saved (Ctrl+Shift+U). Previous/Next buttons in bottom panel to switch to previous/next image in the current folder. Options to show only raw files/only bitmaps in the file manager. ImageView reloads last image when the file manager is reopened. There's also evidently a Mac client. I don't know if that's always been there, but as this feels like a Mac program that doesn't surprise me. Got a chance to play with this some more. The only reason to call this a Photoshop lite program is the sheer size of Photoshop. This program has I don't know how many different filters, many of which in just casual use had some amazingly cool effects. I can't wait to see what happens with this over the next few years as more and more filters find their way in. The main problem with the program is the overload of options. Quick photo edition isn't where this specializes. Also, to remove a filter, you must right-click on that element and choose “Reset”. Wishlist: That it wouldn’t default to RAW file types and include standard images like JPG and PNG. Photivo is multi-platform -- Linux, MacOS and Windows releases available, as well as a Gimp plugin. Photivo is also natively portable: official instructions are at http://photivo.org/download/windows#portable_mode (as stated previously, it involves the presence of a 'use-portable-profile' file alongside the main program executable). [url]http://photivo.org/[/url] author wrote: Photivo is a free and open source photo processor. It handles your RAW files as well as your bitmap files (TIFF, JPEG, BMP, PNG and many more) in a non-destructive 16 bit processing pipe with gimp workflow integration and batch mode. Photivo tries to provide the best algorithms available; even if this implies some redundancy. So, to my knowledge, it offers the most flexible and powerful denoise, sharpen and local contrast (fake HDR) algorithms in the open source world. [...] It needs a quite strong computer and is not aimed at beginners. Download the latest 32 or 64-bit Photivo release (currently dated 2014-05-25) from http://bitbucket.org/Photivo/photivo/downloads. Unfortunate but still a fantastic program even if it’s not seeing windows updates. Trolltech keys in the registry.